New Clearance "While Supplies Last" Items!! New items have just been added to the "While Supplies Last" aka Clearance section of my website. You can see the items below and you are able to click on the item to be taken to my website to order it. As it says these items are While Supplies Last, so if you see something you want you better get it ordered quickly! These items usually don't last very long! It is time for yet another video in the Artbooking Made Easy Series. Here's a friendly tip: try the friendship-themed keys of the Cricut® Atbooking cartridge from Close To My Heart for layouts that shout in celebration of your cherished relationships! To order your very own Artbooking Collection, just go HERE on my website. Say it with subway art! Make a tile trio using this fun technique and the My Creations® 6" x 6" canvas display. Everyone is gearing up for the Day of Thanksgiving and spending quality time with family! Of course lots of people are also gearing up for the Black Friday Sale deals. I would like to offer a Thanksgiving Sale also! But you don't need to be up at 3am or out shopping on Thanksgiving evening, what is up with that stores, really!! You can shop on my website anytime between now and Sunday night at midnight. Place an order on my website and receive Free products!! The free items will come direct from me in a Thank You card. 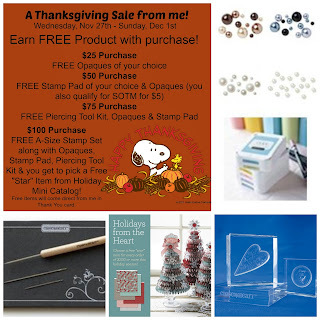 Just select JOIN by "Thanksgiving Sale" when placing your order. Until my next post, Happy Thanksgiving!! The corporate office has released the Retiring Items List in preparations for the Spring/Summer 2014 Idea Book. If you see something you want to order, these items are retiring & are only available while supplies last. If you see something you want to order, you can click through to my website on the item below or contact me to place your order.